Last month, Louisiana became the 31st state to join the Enhanced Nurse Licensure Compact (eNLC). Louisiana is a brand new addition to the compact states as it never joined the original Nurse Licensure Compact. This is great news, as it will make it a lot easier for nurses from other states to take up jobs in the state, and for nurses from Louisiana to pursue nursing job opportunities elsewhere. Don’t start planning your move straight away though – the changes will go into effect in December at the earliest! 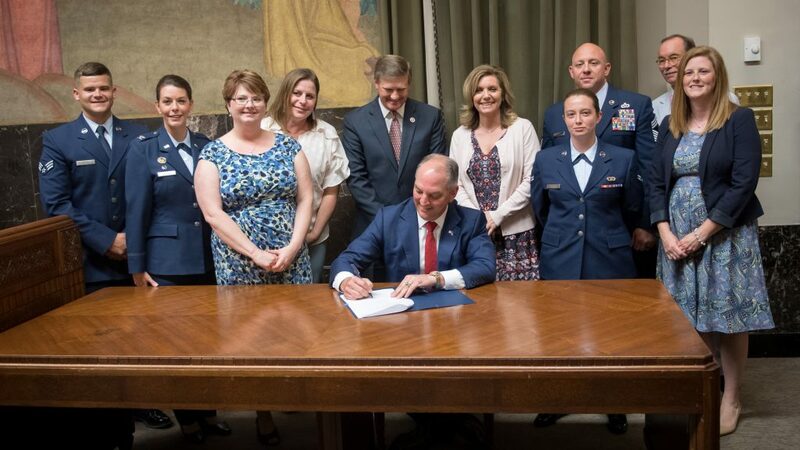 On May 31, 2018, Louisiana Governor John Bel Edwards signed legislation recognizing and adopting the Enhanced Nurse Licensure Compact and the Physical Therapy Licensure Compact. The legislation, sponsored by Louisiana state Senator Barrow Peacock and state Representative Dustin Miller, enjoyed widespread support from Louisiana nurses and physical therapists, healthcare employers and businesses across the state. “By allowing professionals with the right experience and licensure to practice within our state and our area, we can attract the best and brightest professionals as well as fill shortages we have within the healthcare community,” said Lisa Johnson, president and CEO of the Bossier City Chamber of Commerce. Louisiana nurses and hospitals thank Senator Barrow Peacock and Rep. Dustin Miller for successfully championing SB 202. The new law allows Louisiana to join a majority of other states in adopting the enhanced Nurse Licensure Compact. The legislation will also “allow licensed military dependents to more easily assimilate into the local workforce,” Tech. Sgt. Daniel Martinez reported last month. The story of Shellie Neuman, a registered nurse and Air Force spouse, illustrates how much of a difference this will make. She testified in support of the new legislation, telling the Louisiana state senators how long she had to wait to work as a nurse in Louisiana. “I was a Texas registered nurse and they are part of the compact. I practiced on that license in five other states. When I moved here, I had to get a Louisiana license and could not practice. From start to finish, it took me six months to get my license,” she recounted. The new legislation should significantly reduce such bureaucratic hurdles. Until implementation, RNs licensed in Louisiana hold single state licenses, not Compact multistate licenses and are not authorized to practice in any other state by virtue of their Louisiana single state license. Additionally, nurses wishing to practice in Louisiana who hold Compact multistate licenses from another state must still apply for a Louisiana single state license. There was more good news elsewhere, though. Louisiana is not the only state that will be joining the Enhanced Nurse Licensure Compact. Kansas will also be implementing the eNLC. In that state, the change is scheduled to take place on July 1, 2019. After that, not one state between Mississippi and Idaho will be left outside the eNLC. Enhanced Nurse Licensure Compact states: current status and planned changes. Do you know of any RNs that hold a LA and Texas license that would be willing to let me practice under their supervision while I take a refresher course while on probation ? If you hold a current Louisiana license when is the soonest we can apply for a compact license? This was very helpful to me . I’m planning to move to Texas next year and I’m an LPN in the state of Louisiana. I do have a prior felony conviction and my license was placed on 2 years supervised probation; probation which is complete at this time. Will this affect my trying to gain employment as an LPN in Texas? I am in the same boat. I am coming off of suspension (LPN) in Louisiana and live in Texas. I have to take. Refresher course, theory can be taken online but clinical portion needs to be in Louisiana and that is 3.5 hours one way. The director did mention I could work under a RN that holds a LA & TX license , I am looking for that person that will allow me to practice temporarily under her/his supervision for 60 hours or until completed. Does anyone know of anyone ? I am an LPN and have worked travel assignments for the last 4 years. I think every state should be compact, afterall, nursing is a standardized profession. I am so glad to see this new state law for travel nurses. I’m so excited to hear that Louisiana will be a compact state . I been waiting for this a long time . I did travel nursing for a long time , but recently stop can’t wait to start again once it’s official .